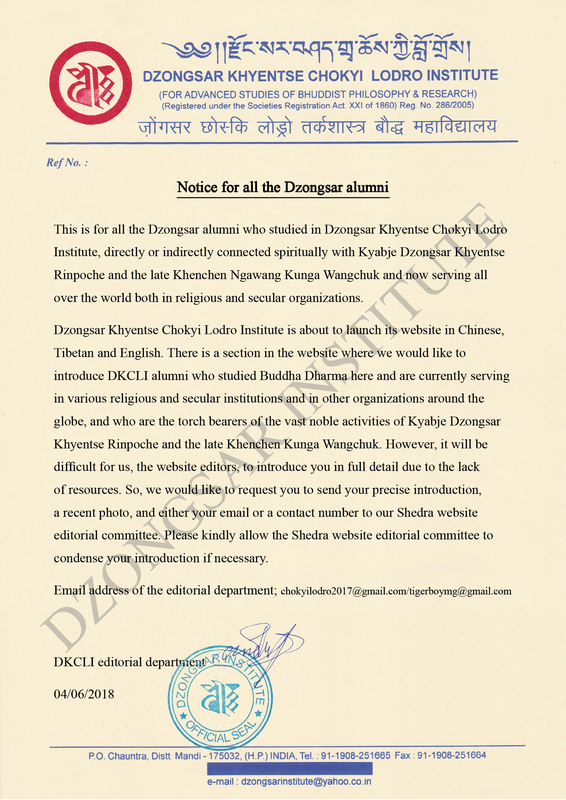 Dzongsar Khyentse Chokyi Lodro Institute is about to launch its website in Chinese, Tibetan and English. 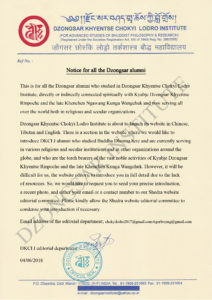 There is a section in the website where we would like to introduce DKCLI alumni who studied Buddha Dharma here and are currently serving in various religious and secular institutions and in other organizations around the globe, and who are the torch bearers of the vast noble activities of Kyabje Dzongsar Khyentse Rinpoche and the late Khenchen Kunga Wangchuk. However, it will be difficult for us, the website editors, to introduce you in full detail due to the lack of resources. So, we would like to request you to send your precise introduction, a recent photo, and either your email or a contact number to our Shedra website editorial committee. Please kindly allow the Shedra website editorial committee to condense your introduction if necessary.